The Corpse of Anna Fritz (El Cadaver de Anna Fritz) is a Spanish horror that from the synopsis sounded a lot like 2008's Deadgirl, however this turned out to be something far more realistic and suspenseful. I had to make a decision when reviewing this as there is a huge twist very early on into the films run time (around fifteen minutes in). I have decided I won't ruin this twist but that does limit me somewhat in what I can talk about. What I can say is that The Corpse of Anna Fritz is a real thriller with suspenseful moments that left me with my heart constantly in my mouth. 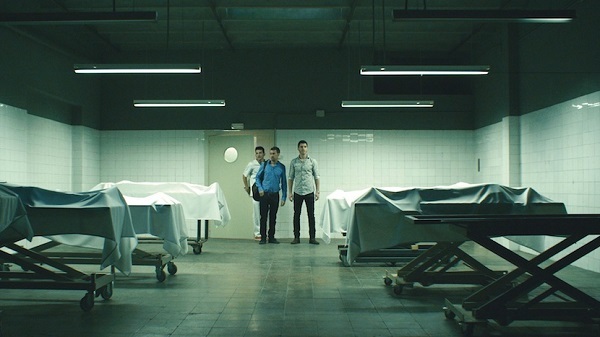 The majority of the film takes place in the morgue, a claustrophobic, stark setting that helps to bring focus on the unfolding horror. This is just 74 minutes long, but for me this was a perfect length, any longer and parts of the film would have felt a bit padded out or unnecessary. As it is there is no let up in what happens, for the hapless trio things get increasingly dark with the odds getting ever more severe. The worst part of the film is the character types of the three men who fall into obvious settings. First you have Javi who from the start is the moral voice of the three, he is a good person who is sensible and heroic in his own way. Next you have Ivan who is the leader of the three, he is arrogant, bullying and really not a nice person at all, as an example he hints at one point of having taken advantage of drunk girls in the past. Lastly is Pau who is a cowardly mix of the two. He encourages Ivan's behaviour initially but when things go sinister he is too scared to do anything but be led by the dominating leader, despite not having his heart in it. With the exception of Ribas (who does a fantastic job seeing as she is just a dead body) there are no other characters who get more than a few lines and so this focus makes the men's plight more engaging. It is in Spanish with English subtitles but apart from a few moments I had no trouble following who was who. The actors all do the best they can with such rigid archetypes even if they did feel a little bit unrealistic. There is a perfect blend of suspense, the constant threat of being discovered, the divisions between the characters, and the events that happen made me so nervous as to their fate. This wasn't me liking them, they were despicable people, but by the voyeuristic act of having watched them I felt involved in their crimes and felt sick to my stomach at the thought of getting caught. The fact that this was horror in very realistic terms rather than having some kind of movie monster or supernatural element helped to really create a sinking sense of threat. The Corpse of Anna Fritz is a dark and sick film, the realism made it easy to imagine what you would have done in a similar situation while the sparse environment brings plenty of drama. At times it does feel a little bit silly with it's plot contrivances but overall I was impressed.